Ontario’s environmental commissioner Dianne Saxe paid a visit to Hastings County on Thursday, Feb. 14 to share her 2018 Environmental Protection Report – Water, Wetlands, Woodlands and Citizen Science with more than 100 concerned citizens from throughout the county. 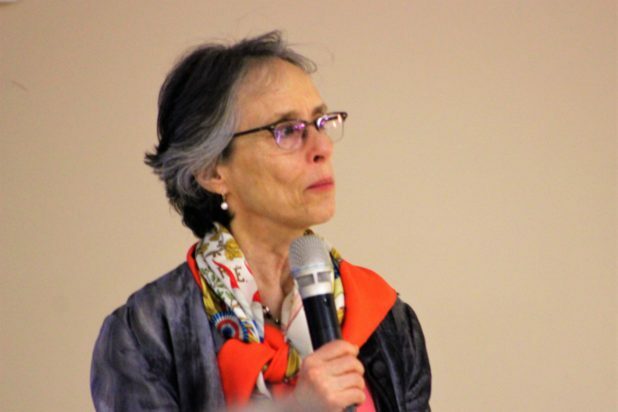 Stressing the importance of protecting Ontario’s drinking water from pollution, Saxe began her presentation by shining a light on the Walkerton water crisis in 2000 that killed seven people and poisoned thousands more. To ensure this type of tragedy never occurs again, she said it is important to take a look at what was learned from the crisis. What the Walkerton water crisis did, Saxe said, is drive home the need for the provincial government to establish a multi-barrier protection of Ontario’s drinking water. Some of the laws created in Ontario in response to the deadly poisoning of the community in Walkerton include: the Safe Drinking Water Act (2002), Nutrient Management Act (2002), and the Clean Water Act, (2006). Saxe said the Clean Water Act creates the first layer of this barrier by protecting lakes, rivers and aquifers as sources of municipal drinking water from pollution. To determine whether the Clean Water Act and the watershed planning approach are working, Saxe said the environmental commissioner’s office has reviewed some 500 policies within eight of the province’s 38 source protection plans. By means of this review, she said her office has identified three major threats to Ontario’s drinking water: manure spreading, waste sites and fuel handling and storage. On many levels, Saxe said the Clean Water Act and the local watershed planning approach have been effective. However, she said there are still several gaps in protection that threaten Ontario’s drinking water and public safety. Although source water protection committees led by conservation authorities have developed valuable watershed information, identified hundreds of significant threats to municipal drinking water, and created individually tailored source protection policies in many communities, Saxe indicated that there are loopholes in the legislation that limit the ability of these committees to address threats from fuel, manure and old contaminated industrial sites. While the provincial government has provided over $275 million in funding for the source protection program more than the past 14 years, Saxe is concerned that the current government has yet to commit any funding to the program beyond March 31. Despite the protective measures currently being taken, Saxe said there is “a sea of pollutants harming Ontario’s waters.” One of the primary reasons for this, she said, is that the provincial government has deliberately left big gaps in other water protection laws. The sources of this pollution, according to Saxe are: raw municipal sewage, agricultural runoff, industrial toxic wastewater, and road salt. Last year, Saxe said there were 766 combined sewer overflows in 44 municipalities, from Toronto to Moonbeam; as well as an additional 561 overflows from shutdowns. The raw sewage pouring into Ontario’s lakes and rivers as a result of these overflows contaminates the water with pathogenic E. coli, which leads to beach advisories and closures. For nearly two decades, Saxe said the Ministry of the Environment has done little to nothing to enforce its own policy on Pollution Prevention and Control Plans for municipal combined sewage systems or the Ontario Water Resources Act. She said the government needs to act to ensure that very municipality with combined sewers is doing everything practicable to virtually eliminate combined sewer overflows within a reasonable time. This means developing Pollution Prevention Control Plans, stormwater fees, and green infrastructure. In terms of farm runoff, Saxe said the phosphorus that is entering Ontario’s waters feeds algal blooms, which alter ecosystems, damage recreational and commercial fishing, and raise the cost of treating drinking water. According to Saxe, this problem has been exacerbated by “weak action” on the part of the Ontario Ministry of Agriculture, Food and Rural Affairs. Though OMAFRA encourages best management practices that may reduce phosphorus runoff, she said the ministry does not track or evaluate them. Furthermore, she said only some farms monitor phosphorus application to assess the risk of nutrient loss, and less than half of all manure spreading is controlled by OMAFRA. By allowing the spreading of manure/fertilizer to take place over the winter when risk of runoff is highest; and subsidizing wetland loss, which increases erosion/phosphorus runoff, Saxe said OMAFRA continues to worsen the situation. She recommends that the provincial government step in “to ensure dramatic reductions in phosphorus runoff from farms” by establishing clear targets, effective monitoring, and financial incentives. Provincial legislation meant to protect people from toxic wastewater created by industry in Ontario is also inadequate, said Saxe. At the moment, she said industry is discharging more than 50 toxic contaminants into Ontario’s waters, including heavy metals and carcinogens such as lead, mercury, arsenic, ethylene glycol, ammonia. These toxic chemicals, along with others released into the water supply by industry, poison the environment and pose a serious threat to human health, explained Saxe. Pointing out that the regulations currently in place are over 25 years old, she said it is time for the provincial government to update limits on toxic industrial wastewater, and require industries to use the best current technology to keep toxics out of Ontario waters. The environmental impact of road salt also needs to be addressed to protect the water, said Saxe. By contaminating the water and snow, she said road salt harms plants and fish, while making metals more toxic and altering how lakes absorb oxygen. Considering road salt is often over-applied, especially by the private sector, and the fact most municipalities do not have a salt management plan, Saxe said the province needs to take action. She recommends that the government create legislation that requires municipalities and private contractors to minimize road salt pollution of Ontario waters. “We take our water for granted, and we think we are doing a good job looking after it, but we’re not,” said Saxe. Next, Saxe focused her attention on the biodiversity crisis in Ontario and the growing importance of citizen science. Species throughout the province are under attack, she said, facing numerous threats such as habitat destruction, invasive species, overexploitation, pollution, disease and parasites, and climate change. Pointing out that extinctions are happening at 1,000 times the natural rate, and that species populations in the Americas have declined by 31 per cent since European colonization, Saxe said the potential ecological, social and economic consequences of this crisis are on par with those posed by climate change. Combined with the effects of a changing climate, she said the impact of the biodiversity crisis could be catastrophic. Saxe said the first step towards protecting biodiversity is monitoring species in Ontario. Saxe said the contribution of citizen science to the understanding of Ontario’s biodiversity has become more and more important in recent years. She attributes this in part to the development of mobile apps such as iNaturalist that allow for more effective data collection. Saxe said the role of Indigenous communities in monitoring species has also been growing in Ontario. Also giving a shout out to the volunteers on the Ontario Biodiversity Council, she said that every five years they release a report detailing the state of Ontario’s biodiversity. In order for the council to continue its work, Saxe said the province must provide them with adequate long-term support. According to Saxe, another factor contributing to the biodiversity crisis is the threat of wildlife disease. She said diseases such as white-nose syndrome, chronic wasting disease, Lyme disease and West Nile virus have a devastating impact on plants, animals, the economy, and human health. Noting that most diseases require specific environmental conditions, Saxe said climate change will likely expand and/or alter the range of these wildlife diseases. Stating that early detection is key, Saxe said Ontario needs to be prepared for both increasing incidences of new wildlife disease and worsening impacts from diseases that are already established. Though the Ontario government relies on partnering organizations such as the Canadian Wildlife Health Cooperative to detect wildlife diseases, she said they do not support them. Because the type of critical surveillance needed to do this work requires long-term staff and financing, Saxe said the provincial government would be wise to provide a formal commitment to sustained funding to partners such as the CWHC. As hubs of biodiversity, Saxe said wetlands provide critical habitat and breeding grounds for dozens of species at risk, while at the same time producing valuable ecosystem services that contribute to climate change adaptation. Sadly, she said southern Ontario has already lost nearly three quarters of its original wetland cover, and many remaining wetlands are still being destroyed. According to studies by Environment Canada, Saxe said Ontario requires a minimum of 10 per cent wetland cover for watersheds in Ontario to remain healthy. Highlighting that Essex County has 1.5 per cent wetland cover and the St. Clair Conservation watershed has only 0.1 per cent remaining; she said much more needs to be done across the province to protect wetlands. “We know that without wetlands in times of drought and floods, there is no place to hold the water,” Saxe said. The government’s approach to wetland protection is “fundamentally flawed,” Saxe said, because these ecosystems do not earn protected status until they are officially designated as “provincially significant,” and there is currently a 260-year backlog of wetlands awaiting designation. Since 90 per cent of the wetlands that have been evaluated to date are designated as provincially significant, Saxe said the best way to protect these ecologically and economically productive areas is for the government to treat all wetlands in southern Ontario as PSWs until proven otherwise. She also recommends that the Provincial Policy Statement be revised to provide stronger protection for Ontario’s wetlands. While conservation authorities do possess the jurisdiction to prohibit or regulate activities capable of changing or interfering in any way with a wetland, Saxe said they are limited by: a lack of provincial direction; missing or problematic definitions of “interference” and “wetland”; insufficient resources; and 11th hour involvement. Saxe said conservation authorities should have clear authority and resources to regulate all activities that interfere with all wetlands and should be involved in the early stages of relevant planning decisions. Saxe said the current government’s wetland strategy is focused too heavily on biodiversity offsetting. Because of its limited effectiveness and some features of wetlands such as bogs and fens are not replaceable, Saxe said offsetting is not a viable substitute for protection. For these reasons, she said the government should only allow offsetting as a last resort where wetland loss is unavoidable; and only if key ecological functions are successfully and permanently replaced. Saxe also spoke to the crowd about the benefits of forests, proclaiming that “healthy trees and forests are essential for healthy communities.” By retaining and filtering stormwater, she said forests prevent erosion and recharge groundwater. Furthermore, Saxe said forests: mitigate the effects of climate change; reduce the heat island effect experienced in urban areas; filter air pollution; provide habitat for wildlife; and improve people’s physical, emotional, spiritual and mental health. Acknowledging that “most forests are privately owned and chipped away bit by bit,” Saxe said more needs to be done to protect Ontario’s forests. She said development or site alteration should not be permitted in forests designated as “significant woodlands” unless it has been demonstrated that there will be no negative impacts on the natural features or their ecological functions. Unfortunately, not all municipalities designate “significant woodlands,” said Saxe. To compensate for the province’s decreasing forest cover, she recommends that the government support tree planting and forest stewardship on private land to fairly share the financial burden and benefits. Saxe also suggests the government commit to providing funding for, and public access to, biologically and climactically appropriate seed. Urban forests are also in trouble, Saxe said. Making urban reforestation more difficult, she said is that many municipalities must overcome legacy issues from poor planning such as degraded soil quality, the lack of soil, and the presence of invasive or inappropriate tree species. Since municipalities are forced to absorb the majority of the costs involved with maintaining urban forests, she said the government should establish an Ontario urban forest centre dedicated to protecting and enhancing urban forests. Before wrapping up her presentation, Saxe shared her concerns regarding the Ford government’s plans to weaken or eliminate legislation in place to protect the environment. Some of the legislation in jeopardy is: Climate Change Mitigation and Low-carbon Economy Act; Green Energy Act; Endangered Species Act; Growth Plan. On or before May 1, Saxe said the Ford government has announced that her work through the environmental commissioner’s office will effectively be eliminated when Schedule 15 of Bill 57 is proclaimed. Once this comes to pass, Saxe said her obligation to deliver an annual report to the Legislature on the Environmental Bill of Rights will be transferred to the Auditor General of Ontario. Although the Auditor General will have the authority to provide such reports, she said they will no longer be obligated to do so. In the meantime, Saxe said she plans to continue serving the people of Ontario. “Environmental rights … they’ll still exist, but they won’t be as well known, they are going to be harder to use and I don’t think they are going to be as successful, because we played a really big role in helping to support the public in using those environmental rights,” said Saxe.